Out of print, but some hard copies are available. Email me: rbalthazar at msn.com to get one for only shipping/handling costs. Serpent Mound. 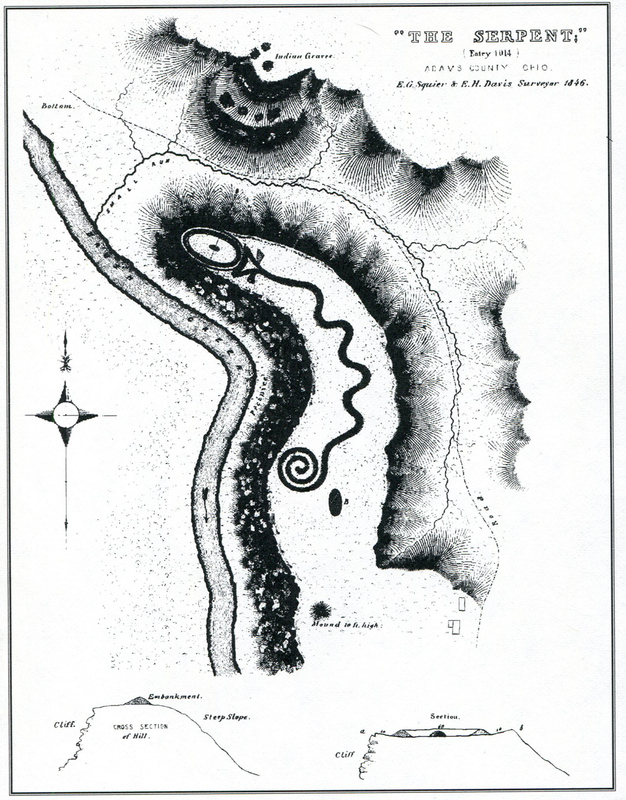 The most famous earthwork in the Americas, the Serpent Mound in Adams County, Ohio, lies on a high spur of land and is some 1,400 ft. in length and 4-5 feet high and probably dates 100 BC – 100 AD. 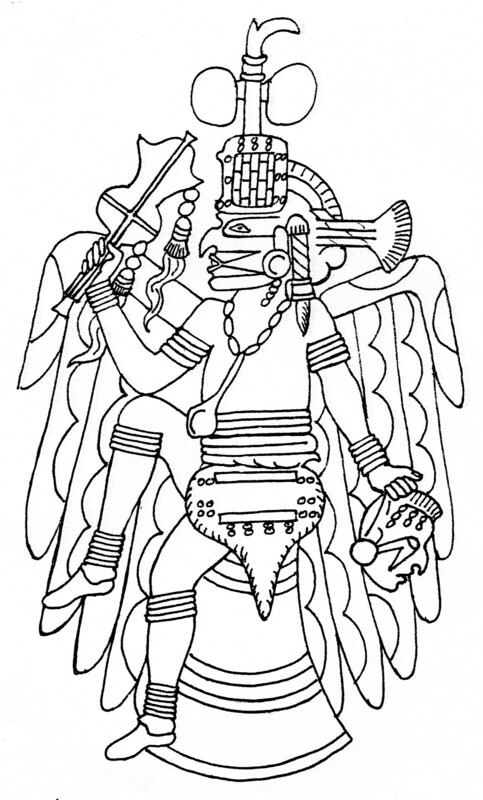 The survey shows triangular elevations near the head which have not been noted in later renderings and may suggest a plumed serpent. It is now a State Memorial and has been somewhat altered. Now nearly a quarter-century old, REMEMBER NATIVE AMERICA is somewhat out of date, but not all that much really. The main update to note is that now they’ve pushed the Poverty Point dates way back into the BC 2000’s and have found other mounds in northern Louisiana dating back to 3500 BC. In addition, archaeologists have now established details of a history for the Mississippian city of Cahokia in Illinois, and many other mound sites are now publicly accessible and acknowledged as important historical artifacts. 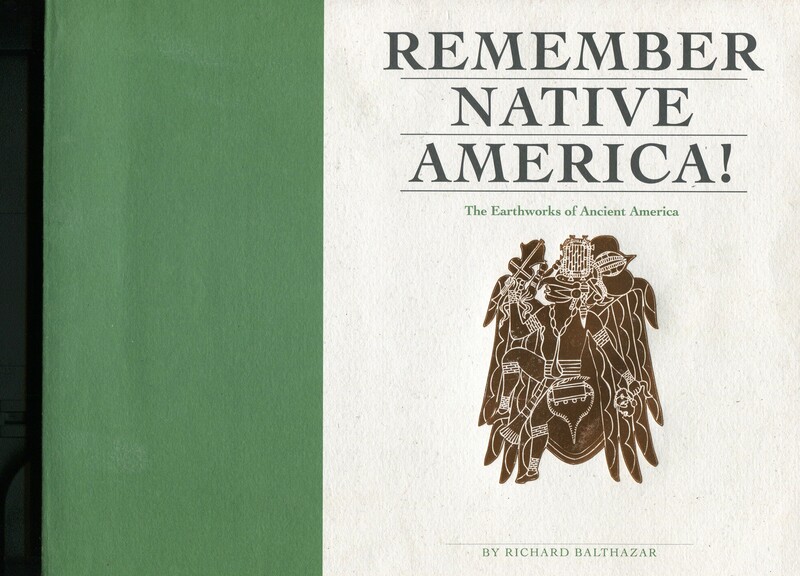 Nevertheless, this old book remembers 3,000 years of Native American history before Columbus as I discovered it so long ago. It’s an album of more than 120 monumental earthworks in 20 eastern states: conical burial mounds, embanked circles and geometrical figures, animal effigies, platforms, and pyramids. These prehistoric artifacts are shown in rare surveys, maps, drawings, and photographs. Newark Works. 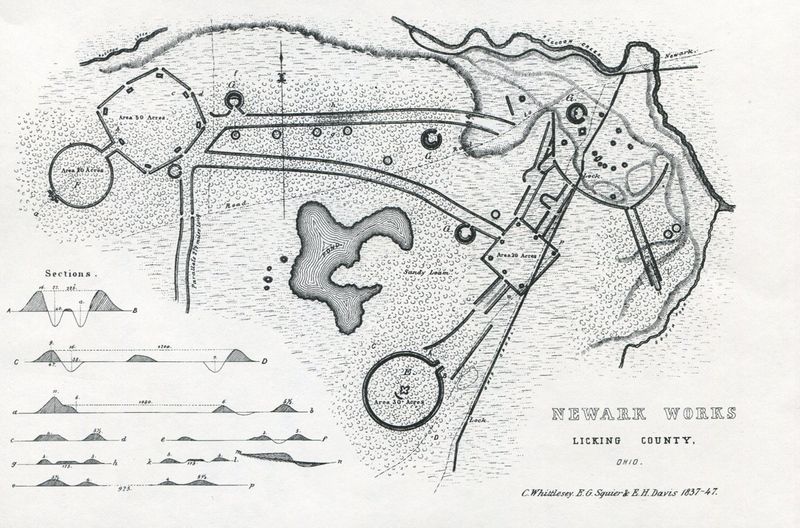 One of the largest Ohio earthworks covering more than four square miles and dating around 0 – 200 AD, the Newark Works contained the classical forms of Hopewell earthworking. These have now been much obliterated by the modern town, with the Octagon and attached circle still surviving in a golf course and the lower circle hiding safely in a park. Much of the material is reprinted from “Ancient Monuments of the Mississippi Valley” (1841), by E. G. Squier and E. H. Davis, and from “Report on the Mound Explorations” by Cyrus Thomas (in the 1890-91 Annual Report of the Bureau of Ethnology). Some of the photographs are my own, and those and many others I’ve taken of mound sites since are included in my Gallery of Indian Mounds. I welcome your photographs of other sites to add to this gallery, with proper photo credit given, of course. Contact me. In addition, the book presents a bunch of my line-drawings of artifacts found in mound excavations. 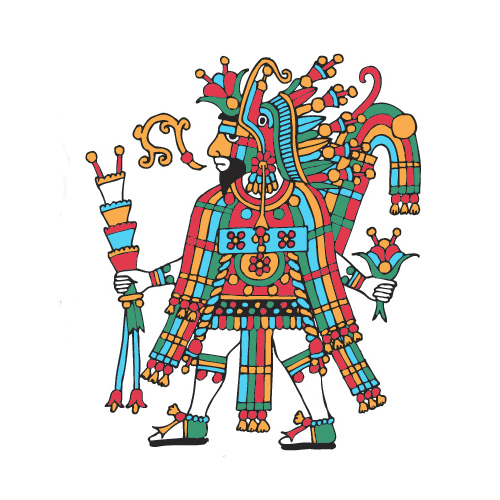 They are also available for easy download in my Gallery of Pre-Columbian Artifacts. The Rogan Plate #1, repoussée copper with cut-outs, AD 1200-1400, was found at the Etowah site in Georgia and is perhaps the finest example of the Mississippian Falcon Warrior. In the 18th and early 19th centuries, as settlers from the new United States of America poured into new territories and across the Mississippi River, innumerable earthworks of the mysterious mound-builders were found everywhere. The fascinated public subscribed to several myths, like Atlantis and the Lost Tribes of Israel. 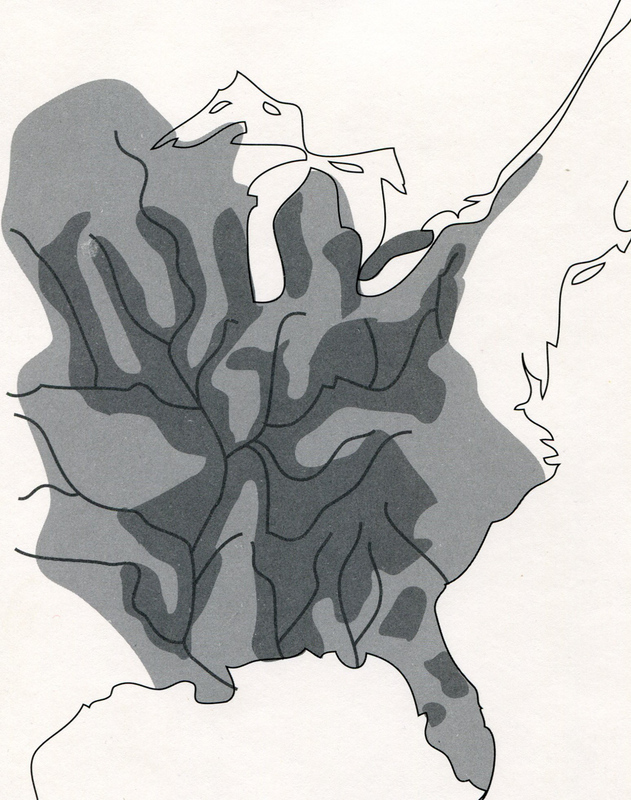 The central Mississippi Valley was popularly viewed as America’s Egypt. Towns were named Cairo, Karnak, Thebes, Memphis, Alexandria, etc., and featured prominent Mound streets, avenues, cemeteries, parks, and lakes. By the turn of the 20th century, local treasure-hunters had ransacked most of their ancient landmarks. Huge numbers of artifacts disappeared into private collections, but many barrels of relics were dutifully sent to the Smithsonian for safekeeping. In the years since, earthworks kept falling to the plow in farmers’ fields, as fill, for new roads, or to construct modern buildings. Thousands of these eloquent earthworks and artifacts have now vanished forever. Distribution of Earthworks. Of several types and in three distinct eras, earthworks were raised all over the half-million square miles of the Eastern Woodlands and more.